A wry, intelligent romantic comedy. Highly endearing... Fischer and Messina have winning chemistry. "Totalement attachant...Fischer et Messina ont une chimie incroyable." 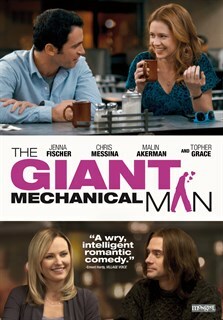 The Giant Mechanical Man is a funny and heart-warming romantic comedy that examines the lengths we're willing to go in order to find the perfect partner. Janice (Jenna Fischer of The Office) is down on her luck. Out of work and living with her well-intentioned but overbearing sister, she is struggling to build a fulfilling life. When she meets Tim (Chris Messina), a street performer whose unique talents as a "living statue" don't exactly pay the bills, she recognizes a kindred spirit. Also featuring Topher Grace, Malin Akerman and Bob Odenkirk.